Alejandro “Al” Perkins, partner in a Baton Rouge law firm and Chairman of the Board for the University of Louisiana System, will serve as the keynote speaker for Louisiana Tech’s winter commencement ceremony at 10 a.m. Saturday, March 3, in the Thomas Assembly Center (TAC) on the Tech campus. Perkins’ family includes wife Dina and daughters Alexia and Zaiya. A native of Dallas, Perkins earned his undergraduate degree in political science from Xavier University of Louisiana in 1999 and his Juris Doctorate from Southern University Law Center (SULC) in 2004. After a two-year judicial law clerkship for the Honorable Judge Wilson Fields at the 19th Judicial District Court, he joined Hammonds, Sills, Adkins and Guice law firm. Al is a litigator specializing in complex litigation, general liability, workers’ compensation, labor and employment, education law, and insurance defense. 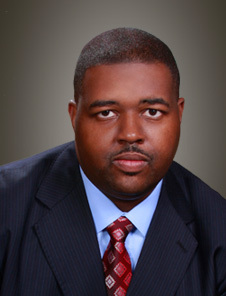 He is the youngest partner of the firm and also an adjunct professor at Southern University Law Center. In July 2016, Perkins was appointed by Gov. John Bel Edwards to the Board of Supervisors for the University of Louisiana System. In January 2017, he was selected by his fellow board members to serve as the Chairman of the Board for the University of Louisiana System. Perkins said he wants to leave Tech’s winter quarter graduates with the knowledge that “they are significant right now,” he said. “You don’t have to wait 10 years until you’ve landed your first big case or successfully performed your first surgical operation or created something wonderful and new in science that changes the world. What you are doing right now is important. Perkins has had the distinction of being recognized by both of his Alma Maters Xavier University and Southern University Law Center. In 2015, Xavier University recognized Al as one of its top “40 under 40” for his vast accomplishments and service to his community. Southern University Law Center awarded Al the honor of 2013 Distinguished Alumnus in recognition of his many accomplishments to the legal profession and unwavering commitment towards ensuring others have access to education. He received the President’s Leadership Award from the National Bar Association in 2016 and 2012. Winter commencement officially marks the end of the winter quarter at Louisiana Tech. Spring classes are scheduled to begin March 7.